This is not a statement of snobbery. This is not an argument that wine should be saved only for those who can appreciate it. Nor is this an argument that people who aren’t all that fussed about the nuanced flavours in wine are somehow ignorant. The fact is that some people can taste all those things and some can’t. And it’s not necessarily something we can control, either. Okay, so we’ve all heard that a bunch of academics recently reported on this notion of some people being “supertasters” who can detect more flavours with their tongues than those airport X-ray machines can illicit liquids and objects. That these are people with a genetic gift who, by virtue of their abilities, for some reason also gravitate toward the wine profession. Apparently this is a fact. Fine. I had initially tried to deny it, believing instead that wine enthusiasts develop this trait over time and after countless hangovers and hundreds of dollars/pounds of teeth-whitening treatments. But as one critic writes in the Globe and Mail, the genetic argument may in fact convince me. But all this academic mumbo -jumbo is not the only reason why what wine critics say will be lost on people. There is a much more straightforward reason, and that is because wine critics write for people who are a lot like them, not the average person on the street who probably just wants to be swayed to something other than Wither Hills Sauvignon Blanc for a change. Some people just want to be directed to something that won’t disappoint them, rather than be told that they should be able to pick out flavours of cedar, violet and that aromatic dry grass you get on rocky hillsides in August. Most people just want to know why a certain wine is worth looking at, what it might taste like in terms that they understand (does graphite or forest floor really matter to the average person?) and whether it is drier than a scorpion’s armpit in Death Valley or more saccharine than a politician kissing a baby. Take the ice cream cone to the left. I bought it when I was in New Zealand in February. It’s called hokey pokey, which is apparently a distinctly Kiwi flavour. If you were asking me to tell you what it tastes like and whether I’d recommend it, I’d say it’s a vanilla ice cream with lumps of honeycomb toffee mixed through. Would I recommend it? 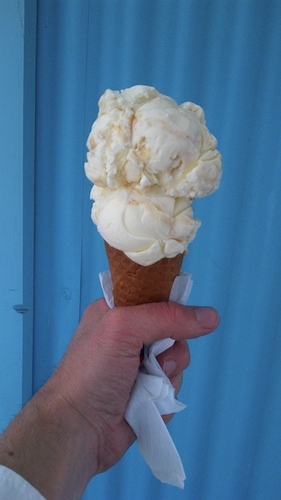 Yes – if you like vanilla ice cream with chunks in it. I wouldn’t get bogged down by the intricate flavours in the ice cream (although I imagine aficionados might) or discuss whether the vanilla is strong or weak enough to stand up to the texture and sweetness of the toffee. Actually, if I wanted, I probably could, but most people I know don’t want that much information. Is it good? Yes or no. I could, of course, be completely misinterpreting all of this, but I think sometimes people just want an honest opinion without all the ponce. This doesn’t change the fact that, if you’re writing for a publication like Decanter or Wine Spectator, the readers want all those details. I read them and I enjoy it. But if your audience isn’t so precise, perhaps people just want you to cut the theatrics and get on with it?